As an athlete, I use protein shakes on a regular basis to supplement my protein needs. Last year I went to a nutritionist for some advice. I kept a food journal for 2 weeks. We looked through my eating habits and it was obvious that I needed to increase my protein intake. I thought I was eating more than enough, but I was barely consuming half of what I required. This meant I wasn’t building as much muscle as I could and my brain function was suffering during training and matches. This explained why I was struggling to focus late in a tournament. Protein comes in many different forms. In our normal food – Meat, fish, beans, cheese, dairy – and now we have to decide between powders and pre-made drinks. It is nearly impossible to consume enough protein through your normal diet, so a protein supplement may be necessary for most athletes. I have tried every kind: the 3 gallon tub of do-it-yourself protein powder and all the premade drinks too. With so many choices out there, how are you supposed to know which one is best for your needs? In the past 4 years, I have been sponsored by 2 of the major brands out there: Core Power and Muscle Milk. I have compiled the most pertinent information here so that you can make a decision for yourself. I have consumed my fair share of both, in every flavor, and would like to share my insight with you as well. Core Power – The flavors are simple, all natural and delicious with no artificial flavors. Since Core Power is made from all-natural ingredients and not a powder, it isn’t as thick as Muscle Milk. It also doesn’t cause that bloated feeling that many people have reported after consuming Muscle Milk. Muscle Milk – They have more flavors available, like Café Latte. The flavors are more robust but sacrifice the all-natural element. 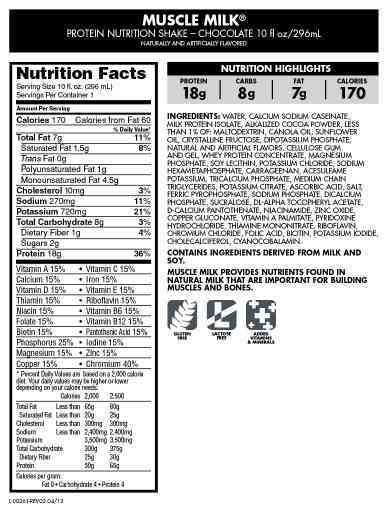 There are many artificial flavors and preservatives in Muscle Milk that allow them to create their custom flavors. The powder based formula also helps creates a thicker product, with more of a “shake” consistency. Core Power – They are a part of Fairlife, LLC, who owns the milk farms, grow their own crops, and take extra special care of their cows that provide milk for the Core Power product. The land is sustainable, using the cow manure to provide energy for their facilities. The cows are what I would call “pampered”. They have sand beds, freestanding stalls that allow them to roam freely and stay protected from the weather. Fairlife goes above and beyond to provide a superior product. 1. Muscle milk is heavily processed. 2. It is artificially sweetened with Acesulfame Potassium, a sweetener that has been linked to cancer. And Sucralose too. After my research and experience with both brands, I have to say that Core Power is the hands down winner! With their all natural ingredients and delicious recipe, I prefer Core Power as my protein shake of choice.